We look forward to welcoming you to our chalet, we have had a great few weeks already, blue skies and lots of snow. We tweet and upload pictures about our chalet regularly! 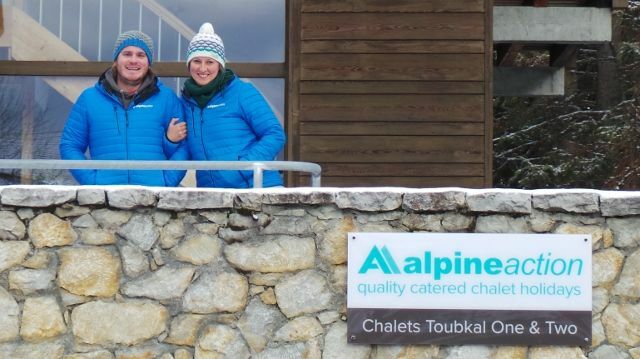 Click the links below to have a look whats going on at Chalet Toubkal Two in La Tania! What makes you the ideal chalet host/rep? I’m a people pleaser, I genuinely want people to have a good time. Vegetarian/vegan/gluten free/ lactose intolerant – you name it I can do it deliciously! I am a qualified naturopath with a flare for healthy cooking, nutrition. I have done a season with Alpine Action last year and followed with cooking for biology and geography students on field trips in the south of France. During our holidays in Portugal Pete took me to an organic restaurant in Lisbon. Yum from start to finish! How do you eat your croissants? What type of skier/boarder are you? What will be your seasonnaire nickname? Sergant Magor – especially on shopping trips! I like things to be done properly. Confidently go down a black run. I can’t watch them, they do scary stuff in them! How did you learn to ski? Graduating from my degree and getting a first in my dissertation. · A hat for each day!